Lack of responsibility—no one took responsibility for the entire inspection. The chances of something being overlooked increase with an increase in the number of mechanics involved in an inspection. The responsible person is removed from the actual procedure. The student remembers hearing the IA ask one of the engine mechanics about the throttle. However, the question was vague, the answer was vague, and the rod-end was not safetied. Complacency—an insidious and hard-to-identify attitude. Each of the mechanics involved in the incident thought someone else had inspected the throttle rod-end. The IA signed off the annual inspection because he had either asked the mechanics about the items on the checklist or in his frequent visits to the airplane had inspected the various items himself and decided that was good enough. Complacency crippled the mechanics’ quality of work by removing any thoughts of double-checking each other’s work. While a definite answer to the question of what happened remains a matter of speculation, professional mechanics should heed warning signs of potential problems. The combination of a lengthy inspection, numerous technicians, an overworked supervisor, a poor checklist, and vague communication should raise a red flag of caution. Although the ultimate responsibility for the safety of any flight rests with the pilot in command (PIC), it is not unreasonable for the PIC to assume that mechanics also take their responsibilities seriously. This scenario underscores the need for safety risk management at all levels of aviation. Safety risk management, a formal system of hazard identification and analysis, is essential in keeping risk at acceptable levels. Part of this process is selecting the appropriate controls to mitigate the risk of the identified hazard. The primary objective of risk management is accident prevention, which is achieved by proactively identifying, assessing, and eliminating or controlling safety-related hazards to acceptable levels. 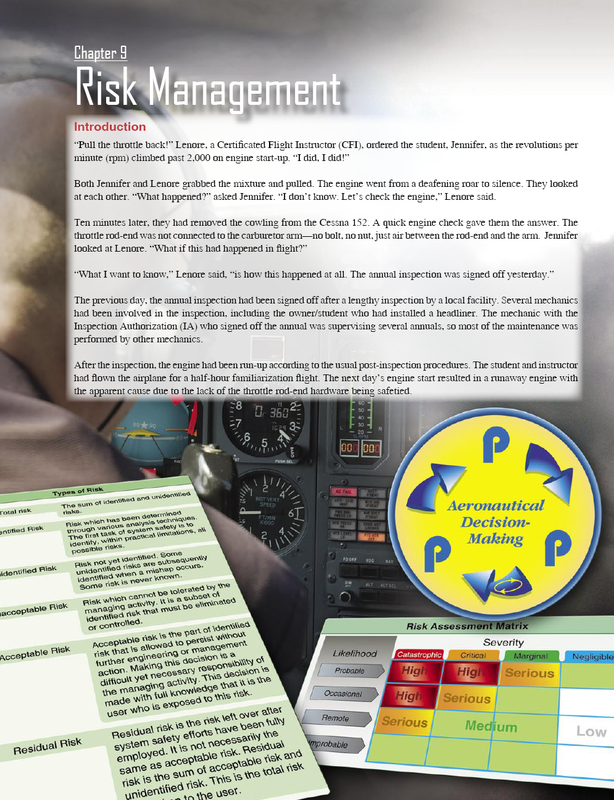 This chapter discusses safety risk management in the aviation community, looking at it as preemptive, rather than reactive. The principles of risk management and the tools for teaching risk management in the flight training environment are addressed in Chapter 8, Techniques of Flight Instruction.